This sign is posted on the entrance door at Westgate Mall. Jerry isn’t alone, though…there are other examples of spelling errors around town right here, too. Don’t forget – you can check out lots of GreaterFalls.com pictures over at the Flickr site, including sets of pictures from the Farmer’s Market (good to chase the winter blues away! ), the State Fair, and Welcome Home RED HORSE! 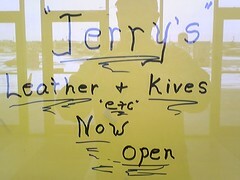 For those who prefer to shop where the spelling is correct, they can stop by the downtown Jerry’s Leather & Knives, located on Central Avenue and 7th Street. David, Jerry was neither offended nor demeaned. His thinking was that it was good publicity. But, for the record, Jerry himself did not make that sign. By the way, the clock is an hour off. I posted my comment at 8:143 AM, not 9:13 AM.